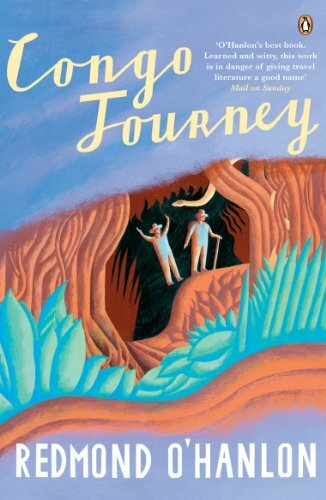 Congo Journey is the Kindle name for Redmond O'Hanlon's book No Mercey: A Journey to the Heart of the Congo which was first published in 1996. I read this as part of a quartet of Congo River books I'd bought with a view to deciding which book was the best Congo River journey of them all. Part way through the book, however, I realised that Congo Journey was quite different from the others, in that the travelogue mostly occurred on land away from the Congo River and secondarily it takes place in the People's Republic of the Congo. The other three books almost entirely take place on the Congo River and within the Republic of Congo (previously known as the Democratic Republic of Congo or more well known as Zaire). So, a fail on my behalf before I really got started! Ostensibly, Congo Journey is a story about O'Hanlon's search through the unmapped forests of the People's Republic of the Congo, in search of a living dinosaur, the Mokélé-Mbembé. Previously sighted in the remote Lake Télé, in its most basic form, it's sort of like an African exploration for Big Foot. All of this, however, belies the rich tapestry of the book. At a deeper level it provides an expose of the Central-Congo Bantu peoples and Congo Pygmies who live on the land and waterways, their interaction with the wildlife and spiritual customs and beliefs. Written with a diary format feel, the book centres as much on the interactions with and between his travel companions as the surrounding jungle, with each providing their own layer to this complex book. The Congolese scientist Marcellin Agnagna, all authority, emotion and loose (Western) morals is a great contrast to O'Hanlon's American friend, the rational Professor of Psychology, Lary Shaffer. Making up this disparate group are two of Agnagna's relatives, the fun loving, cross-eyed Nzé and Manou, the more tragic and put-upon lost cause (of Africa?). With other hazardous journeys under his belt through Borneo, the Amazon jungle and on board a trawler in the North Atlantic, O'Hanlon is in a league of his own as a gonzo travel writer. A Fellow of both the Royal Geographical Society and Royal Society of Literature, he is able to write with extreme authority, however it is his off-the-wall humour that best resonates. O'Hanlon's overarching knowledge of wildlife, and birds in particular, unfortunately also ends up being part reason for why I couldn't fully get into this book. Although written beautifully, the length at which he describes the flora and fauna of the Congolese jungle, whilst initially painting a wonderful picture of the steaming jungle, over time becomes repetitive and boring. Adding little to the overall story, I felt no guilt in skim reading portions of the book which became overly detailed. Be prepared, also, for what I would call "other-worldly reading". At various points, O'Hanlon writes as if in a hallucinatory state, due to being afflicted by malaria, narcotics or bone-tired weariness from his arduous journey. To me, these philosophical interludes, coupled with flashbacks and random meanderings through other topics were overtures to the madness themes inherent within Conrad's The Heart of Darkness. All told, this is an enjoyable read of an amazing journey. Congo Journey provides a multi-layered telling of O'Hanlon's expedition that illustrates the difficulties for the people of the region and its wildlife whilst downplaying the extreme nature of his own journey. It is not an easy read and at times is overly detailed but truly rewards the reader for the effort, not least by avoiding the usual African tropes. If you're looking for a thought-provoking, well written, alternative travel-lit book heavy on wildlife descriptions, then this definitely is the journey for you.